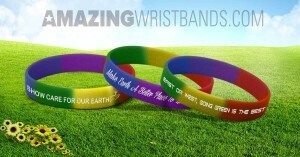 Design silicone bracelets to support upcoming 50th anniversary. Earth Day, the world’s largest environmental event, is observed on April 22 every year. The first Earth Day was in 1970, and the movement has gained great momentum nationwide and even globally in the 46 years since. In fact, organizers are already encouraging people to begin gearing up for the 50th anniversary of Earth Day, which will be observed on April 22, 2020. Consider making custom Earth Day wristbands and spread the word! 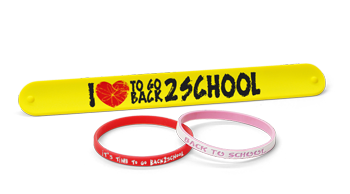 School PTO or PTA organizations purchase these bands as a back-to-school gift for students. Include the school’s web address and phone number, and use the school’s colors. 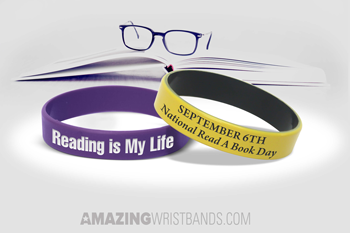 Student groups can create fun school-themed bracelets and sell them as a fundraisers at back-to-school registration events. Teachers can create fun 12-inch slap-bands that serve as rulers. These innovative bands snap to a person’s wrist and fit snugly. Students will never be without a ruler again! Kids can customize their own bands to wear back to school. Make them extra fun with color combinations, glitter, or glow in the dark effects.